Heat honey and chocolate chips in 3-quart saucepan over low heat, stirring constantly, until chocolate is melted; remove from heat. Stir in crushed cookies, walnuts and port. 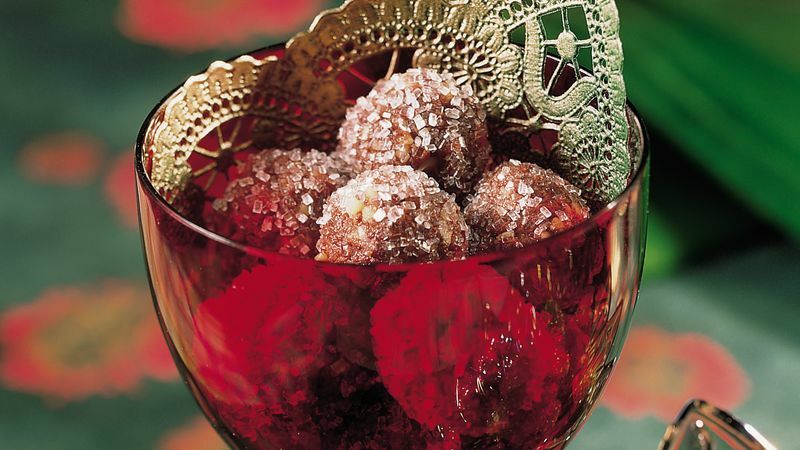 Shape into 1-inch balls; roll in sugar crystals. Store in tightly covered container. Let stand several days to blend flavors. Flavor improves with age up to 4 weeks. Omit chocolate chips and do not heat honey. Substitute dry white wine for the port. Mix all ingredients except sugar. Shape into 1-inch balls; roll in sugar. Continue as directed. Just substitute rum or bourbon for the port. Prepare as directed. To give as a gift, wrap candies individually in colorful plastic wrap or cellophane, and tie with metallic ribbons. Fill a wine glass with candies, and be sure to include the candy recipe with your gift.